It seems like every 5 minutes a blogger writes about how to do SEO. But there are only scarce fragments and side notes on how to actually research and craft a comprehensive strategy & plan for how SEO will be done most effectively for a particular website. This is staggering. The competition online is simply too fierce, too large and too varied to risk compromising on strategy. In this post, I’ll provide a few of my own SEO mental models and some concrete guidance for those who want to get their SEO efforts right the first time. It’s not rocket science, but it does take some discipline, attention to detail and analysis. First, the 80-20 rule. Ideally about 20% of your time allocated to SEO is spent on prep/strategy, while about 80% is spent actually doing the SEO – creating & optimizing content, improving site structure and building external links. But from my experience, roughly 80% of success in SEO is the result of effective strategy and planning. For one particular site that required about a month of SEO research, organic traffic had increased 100% within just 3 months of the initial roll-out of the 1st phase of content/structure changes. And don’t get me wrong – the site was already ranked fairly well across a variety of terms. It just hadn’t picked the right terms – it was not yet positioned hierarchically or around the core value prop. or target audience. Just like any marketing plan, you need a competitive position online that is based on your specific value proposition and core audience. You can’t say “me too” online for very long. There’s far too much of that going on. The key to SEO positioning is centering your keyword mix on the differentiating factors of your value proposition. You need differentiation to have a position that attracts quality traffic, but you also need to test these keywords. This is especially true for smaller sites and smaller businesses. Understand who your competitors are online and study their ranking and website content to ascertain where they’re strongly positioned and where they’re vulnerable. Jump into Google Analytics and look at organic traffic and conversion rates by keyword. Pick the top performing candidates. If you don’t have historical conversion data associated with particular keywords, a modest AdWords budget is an ideal channel for discovering how to refine keyword mix and gain some quantitative support to the keyword mix in consideration. Using keyword traffic research tools, you want to pick the most popular keyword variants within your mix of candidates to be the focal point. Use AdWords keyword research tool and Google Trends. The operative word here is highest possible – don’t sacrifice quality for quantity unless you plan to be a gigantic traffic eating monster like Wikipedia or eHow. As one hypothetical example, it is possible to take a word like “craft beer” and turn it into longer, more specific keywords, like “seasonal craft beers” and “IPA craft beers”. In this way, the core of your focus is around a broader, high-volume keyword mix; but you extend and diversify your keyword array around those core terms. This makes it easier to rank high for keyword variants that competitors may not have thought of. The nice thing about longer keyword phrases is that they tend to produce higher conversion rates. After the keyword mix is visualized and clearly defined, it is crucial to have a concrete plan and timeline for executing an SEO strategy. The first phase is site/content optimization. The second phase is content creation (blogging would be an ideal example of this for small businesses). The third phase is external link building. All of these can be done concurrently, but it is important to at least emphasize each of these phases in the stated order. 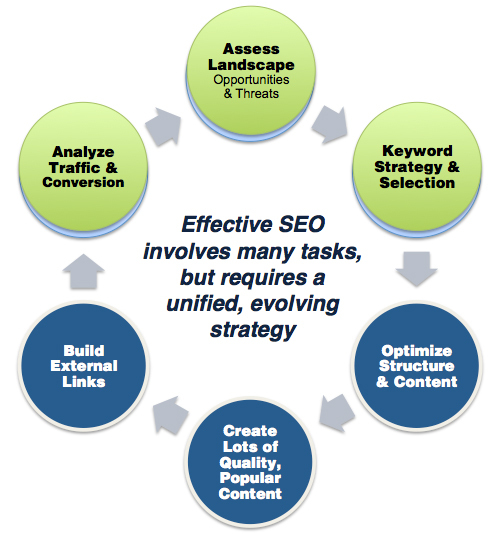 The final component of the SEO plan is a roadmap for measuring and improving upon the SEO strategy over time. If you can’t quantify the impact of an SEO strategy, it’s a waste of time and money. Rank is still a useful leading indicator; however, don’t forget that there are thousands of keyword variants used to find your site. So even if you don’t rank that well for your core keyword, you could be taking #1 spots for lower traffic, higher quality terms. Retention & Customer Value $ (Advanced) – You need a database/eCRM for this. But it is extremely helpful for quantifying the outcome of SEO efforts. If you don’t have a database or eCRM solution, there a good make-shift solution: take the number of new user registrations by month (even if that is a simple .xls file of email addresses w/ dates) and subtract your Google registration conversions. Then, apply your AOV or average annualized customer value $ to the share of new registrants that acquired through organic search. By taking these two simple steps, you are now at least able to quantify the share of new users acquired organically through unpaid search and the approximate share of annual revenue those new users produced. Annotate EVERYTHING – every major change to site structure/content, every ranking milestone, every major Google algorithm update, every major external link building effort. I guarantee you’ll need to look back in order to do effective analysis and be able to articulate the story of your SEO growth. There are far too many variables to keep track of in your head. Use Rank Checker to document rank improvement over time. Later on, you’ll want to overlay this data with traffic & conversion data from organic traffic. You can automate this Firefox add-on to run routinely and check a long list of keywords. Make sure you’re logged out of Google, etc. when you run it or your rankings will be skewed to your personal search history. Everyone can afford to set up a free Google Analytics account and pay a web admin or developer to add Google Goal Tracking. Google Webmaster tools is an important insight tool – I particularly appreciate the previous month comparison chart for keywords. It shows you how much you’re up or down for any given keyword (traffic, click-throughs, etc.). Webmaster tools also provides html suggestions, which is helpful for those just getting started in SEO. Use AdWords keyword research tool. It’s still one of the best tools. While your at it, setup a modest AdWords campaign ($500) and get some initial conversion data on different keywords you’re considering. Although, make sure your statistical sample (number of click-throughs) is large enough to actual warrant any serious conclusions. Review & Analyze weekly, monthly, quarterly & annually – experiment with SWOT analysis approaches and document everything you find. When you annotate your changes, try to include a concise summary of the analytical justification for the change as well. That’s about it. If you follow these steps at the outset, you’ll have a clear sense of where you’re going, you’ll know where to get started and how to prioritize the phases of execution, you’ll know what to do when things aren’t going well, you’ll be able to explain to others why things are going well, and you’ll know how to continually build on the growth and momentum you’ve started. I highly recommend SEOmoz, SEO Book and “The Art of SEO“. Great resources for the beginner or aspiring expert. These thought leaders provide far more insight and expertise than I do on the subject and I couldn’t have had success without them.